Andre Ricard was commissioned to design the Olympic torch, which was a long and complex process that would respond to both the technical and symbolic needs of the device. Regarding technical questions, it had to be taken into account it had to cover 6,000 km of relays. Its relay would have a kilometer length or so, and would last for ten to twenty minutes, and that, following the tradition, each relay runner would keep the used torch. The Polytechnic University of Catalonia Engineers School (UPC) run a combustion systems study to determine that the best option was to use gas. The Catalan Gas technical office was commissioned to prepare a prototype that met the requirements for the torch burning. They also took into account technical aspects such as weight and safety of the athletes. Once resolved the technical issues, they could establish the size of the head and the gas tank and continued to prepare the design, that had to respond to the great symbolism of this object. 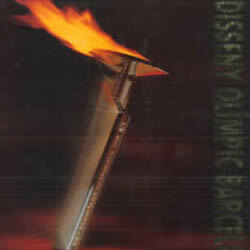 The Barcelona’92 torch had a different and distinguishable design than prior Olympic torches, without breaking tradition. It was an object with aesthetic quality and contemporary forms and had to express what Barcelona is. 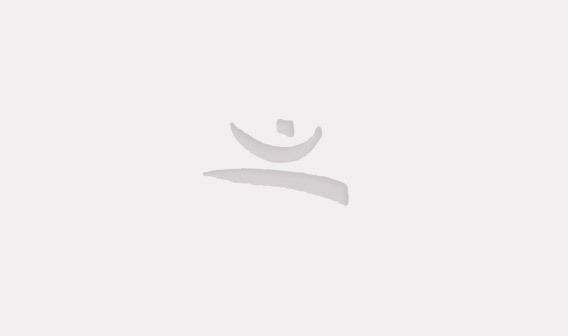 Directionality was given to the torch body in order to be more dynamic and to point its own North, Barcelona, and also the burner shaped head was designed to indicate the final destination of the flame. The torch referred to conical and triangular shapes as a metaphor for the vases and the Mediterranean and it was made of chroming aluminum, not only for the lightness of the material but also as a color representative of our time. Finally it had a length of 66 cm and a weight of 1.2 kg. 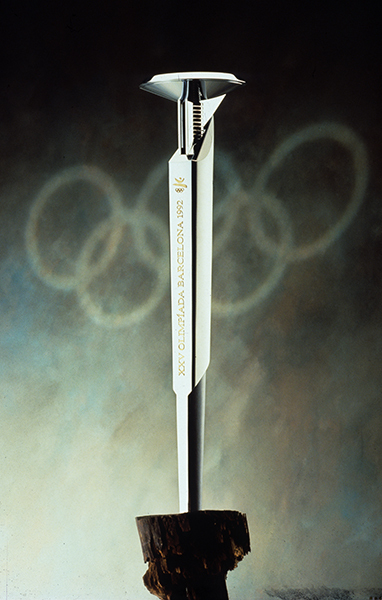 The torch had written on it the emblem of the Olympic rings, the logo of the Barcelona Games ’92, the ordinal number of the Olympiad, the city and the year. In the relay race it had to be foreseen the possibility that there would be setbacks and the torch could get extinguished. That’s why in Olympia three safety lights were lit up to ensure that there was always an original flame to re-ignite the torch. For their design, the traditional design of the miners lamps was adopted and modified to fit the use. The three cylinders had 28 cm of height and 8 cm of diameter and were made with golden brass. Every day the relay finished in a city where a flame reception event was held, lighting a stage cauldron that remained lit for hours. A large and visible cauldron was designed to welcome the flame in a ceremonious way and it was made with a granite monolith finished off with a head as the torch but larger. 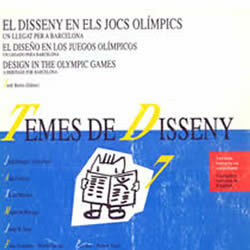 COOB’92 (1992): “La torxa i les cerimònies” a Memòria oficial dels Jocs de la XXVa Olimpíada: Barcelona 1992. Barcelona: COOB’92, vol. 2, pàg. 33-52. Disseny Olímpic: Barcelona 92. [Barcelona]: Lunwerg, 1992.